Indiana University Press, 9780253349385, 264pp. Ludmila Korabelnikova recounts the life and times of Alexander Tcherepnin, a prolific and often emulated composer who produced four operas, 13 ballets, four symphonies, numerous orchestral and chamber works, and more than 200 piano pieces. He was born in Russia in 1899 to a family of musicians and artists. However, Aaron Copland referred to him as "an honorary American composer" and Toru Takemitsu called him "a father figure of Japanese music." 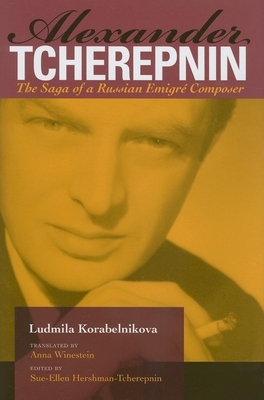 Korabelnikova focuses not only on the biographical elements of Tcherepnin's story, but also on his music and its technical innovations. She includes extended quotations by the composer himself and selective analytical commentary, based on primary sources and contemporaneous accounts. Ludmila Korabelnikova graduated from the Moscow Conservatory with degrees in theory and musicology and has served as Director of Research at the Tchaikovsky Archive in Klin. Currently, she is Distinguished Musicologist and Lead Scientific Researcher in the Music History Department of the Russian State Institute for Art Research. Sue-Ellen Hershman-Tcherepnin has served as Adjunct Instructor at the Massachusetts Institute of Technology since 1991 and performs around the world as a professional flutist. Anna Winestein is a Ph.D. candidate in modern history at Oxford University and a former Fulbright Fellow.